GraysHarborTalk shares our articles through our social media distribution network which currently reaches more than 10,000 local residents. In 2014, we reached the tipping point where more users accessed the Internet from their mobile phones than from desktop computers. While, statistically, mobile users are more in a browsing mood when they thumb through stories — often still preferring to wait to make purchases when in front of their desktops — mobile users do use their phones to research products, compare prices, locate a store, read reviews, or get community recommendations. GraysHarborTalk is a responsive website, meaning that it automatically adjusts to your screen size. This means getting your business in front of viewers while they’re in a browsing — and deciding — state of mind is a key component of an overall marketing strategy. Mobile advertising is predicted to reach $200 billion by the year 2019, compared to nearly $70 billion this year. Mobile users also frequently use their phones to browse social media. Having your business promoted in a user’s Facebook newsfeed through featured business articles and key logo placements on GraysHarborTalk places your brand in front of viewers and gives your business an advantage. 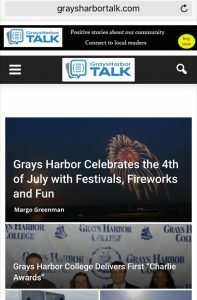 This is why GraysHarborTalk is optimized for the mobile browsing experience as part of its Community Social Network platform. 67% of GraysHarborTalk viewers access the site from mobile devices, compared to 33% on desktops. Advertisers get prime real estate while GraysHarborTalk readers scroll through an article on a mobile device. Place your brand in front of viewers while they are browsing, deciding and reviewing recommendations from friends and community members. Advertise with GraysHarborTalk to reach your target market, grow your brand, and measure results.